When searching for the perfect makeup artist, and with so much information at our fingertips, it is easy to feel lost in the sea of choices. As I celebrate my 25th year in the esthetics industry, I believe there are several important steps in finding an artist that is right for you. With a wide range of beauty professionals to choose from, it can often times feel overwhelming wading through the long list of online beauty vendors. This is where the trusted referral of your wedding coordinator, planner, photographer & florist are invaluable. As they get to experience each vendor first hand, and can attest to their level of professionalism, quality of service, and love for what they do. Nicole Brock, wedding coordinator at Hildene says….”Marieanne Souza, is a true artist. Every bride (at Hildene) who has experienced her makeup skills first hand has been over the moon happy with her including the vision, trial and final look for each bride, bridal party and mothers of the couple. Marieanne's warm personality is equally impressive and the photos are gorgeous! I highly recommend. A well established and successful makeup artist will have a professional social media presence that is crucial for you as a potential client to learn more about them and their unique beauty style. It is important that a makeup artist have a bountiful gallery of their recent weddings and publications. Buyer beware of a gallery consisting primarily of selfies, overly filtered images or a lack of ability to create individual bridal beauty looks. A seasoned professional makeup artist is versed in High Definition makeup application for both film + photography. They have a strong understanding of lighting and longevity of your makeup look. 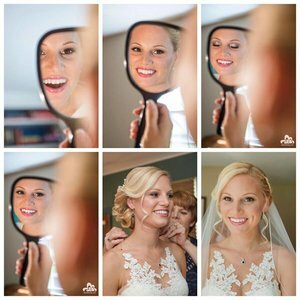 One of the most important elements to a seamless wedding day beauty experience being the timeline. 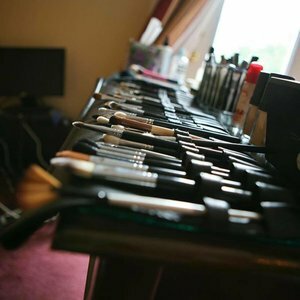 Having a makeup artist that is experienced, proficient, and organized is imperative in achieving the fine balance needed to support a wedding morning preparations. Lastly, do take the time to read their reviews, as this is a window in to the firsthand experience past brides have had with their makeup artist. It is no surprise to anyone that weddings are costly. With a national average being $35,000 and up, today’s brides are ever more mindful of keeping within their budget. As you search through the myriad of choices for makeup services, you will undoubtedly find a spectrum of pricing. A seasoned professional makeup artist rates will reflect those of their skill level and be comparable to colleagues with a similar skill set. While it may be appealing to save on cost, you need to ask yourself what it is you are paying for. Most importantly that your wedding photos are something you will be looking at for many many years to come, and you don’t want to have any regrets. It is hard to hear the sister of a bride tell me that they wished they knew about me when planning their wedding, and sadly share how much they hated their wedding pictures due to poor makeup application. True story! Now you have done your research and have a sense of what it is you are looking for in a makeup artist. Next step is to reach out and inquire of their availability, keeping in mind that the most sought-after makeup artists typically book 12 to 18 months in advance. Therefore, I cannot emphasize enough the importance of beginning your research early. I highly recommend scheduling a phone consult, comprising a list of questions that are most important to you. This time spent speaking with your makeup artist will give you the opportunity to get a sense of how personable and accommodating they are. While skill and professionalism are essential in choosing your stylist, equally important is that they truly love what they do. Your wedding morning preparations are a very intimate time spent with all the special ladies in your life, and you will want someone who is kind, caring and who will hold a space for this joyous occasion. without hesitation be fully versed in what their state board regulations are. Specifically, that a new set of brushes are used for each client, as it is not possible to fully + thoroughly clean and disinfect brushes in between clients. That disposable mascara wands be used, and that all cream products are removed for use with a spatula. There are of course a whole host of other steps involved in the process of ensuring a client’s safety against skin borne infections such as, pink eye, Herpes simplex, staph etc. These are just to name a few. Please know that a makeup artist following proper protocol will welcome these questions. Therefore, you should not hesitate to ask. That old saying could not ring more true than when you arrive at that feeling of knowing this is the makeup artist for you. It is something that is simply felt, a connection, a sense of confidence and relief. All of which you arrived at by taking the time to research, connect and learn who this artist is, what they offer and how they meet your wedding day needs. The end result is knowing that you can relax and be assured that you will be guaranteed a stress free morning on one the most important days in your life.